New Hope Audubon Society receives some funds from the National Audubon Society each year, and we also apply for grants when appropriate opportunities present themselves. However, in order to work toward fulfilling our mission, we also sell bird houses, hold two fund-raising events each year, and accept tax deductible donations. 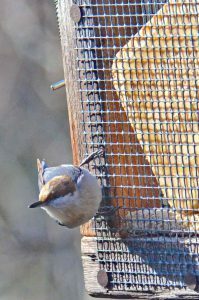 Each fall, New Hope Audubon holds a Bird Seed Sale for fund-raising. All profits go toward fulfilling our mission to promote the conservation and enjoyment of birds, other wildlife, and ecosystems, focusing on Chatham, Durham, and Orange counties. Click here for more information. 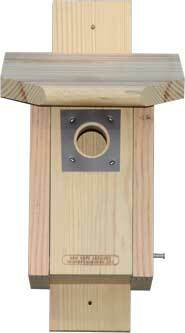 New Hope Audubon has three types of nest boxes for sale, one for Bluebirds, one for Brown-headed Nuthatches, and one for Eastern Screech-Owls. These nest boxes are made by volunteer craftspeople at the Eastern Bluebird Rescue Group, a division of Newell Farms Wildlife Rehabilitation Center, Warrenton, North Carolina. We buy them at cost and add a mark-up for fund-raising with their permission. All proceeds go toward fulfilling our mission to promote the conservation and enjoyment of birds, other wildlife, and natural ecosystems through public education, field research, advocacy, direct citizen action and contributions to other non-profit organizations with similar goals. After you make your on-line purchase below, we will personally make a delivery to you if you live in Chatham, Durham, or Orange Counties in North Carolina, or you may pick up your order at our regular monthly meetings (see Calendar) at the North Carolina Botanical Garden. 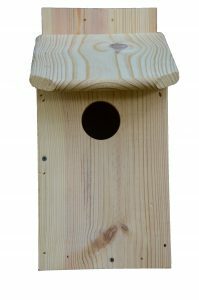 PLEASE NOTE: If you live outside our local area, we will NOT be able to deliver a bird house for you. If you have questions, please contact us before purchasing. Entrance hole diameter (1 1/2 “) is just right for Bluebirds, too small for Starlings. Metal flashing around the entrance hole helps deter predators such as squirrels. Grooves on the inside of the door below the hole help the fledgling Bluebirds climb out of the nestbox when they are ready to take their first flight. Hinged door makes it easy to clean out old nesting material. Written instructions included to help with proper placement and maintenance. Box cross section: 6″wide x 6″deep. Click here for a fact sheet and installation guide from the Eastern Bluebird Rescue Group. *WE DO NOT SHIP. LOCAL DELIVERY ONLY. Identical to the Bluebird nest boxes above except with a smaller entrance hole (1 1/8″ diameter) that is just right for these smaller birds. Click here for a fact sheet and installation guide from Audubon North Carolina. Grooves on the inside of the door below the hole help the fledgling owls climb out of the nestbox when they are ready to take their first flight. These boxes should NOT be cleaned out from year to year. The owls prefer the ‘lived in’ life style. Box cross section: 10″wide x 10″deep. Click here for a fact sheet and installation guide.